Hearing this, Hazrat Sultan ul Faqar Hazrat Sultan Bahu May Allah Sanctify his Secret said 'O Shah Sahib! For the Witness to an incident, how many Witnesses are required as per the Law of Shariyat'? Shah Sahib said 'Two witnesses'. Hazrat Sultan ul Faqar Hazrat Sultan Bahu May Allah Sanctify his Secret said 'take these two hairs of your blessed beard as witness of my presence there'. 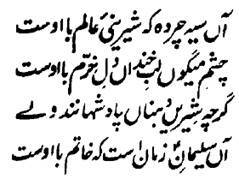 Hazrat Shah Sahib was surprised to see the hair of his beard and at once sought pardon and forgiveness from his highness! However, when that sun rose up, there was nothing to see in sky except the sun! After this Hazrat Sher Shah started talking of secrets in secrecy with Hazrat Sultan ul Faqar Hazrat Sultan Bahu May Allah Sanctify his Secret . He also asked him 'O highness ! You are not seen by us Outwardly in the Majlis of the Holy Prophet Sall-Allahu Alaihi Wa Aalihee Wassallam but you are well above us in respect of the Inwardly Achievements and the Spiritual Power. Where you have been then?' His highness said 'O Shah Sahib! Nine kinds of Majalis of the overlord of the world are held in the Inward. The lowliest of all is that, which is held everywhere in the Realm of the Nasoot. After this, Hazrat Sher Shah was made by his highness his (Spiritual) Caliph upon his request and his highness lifted him from the lower Station to the higher Station.